Make 2013 The Year You Look & Feel Fantastic TerraPur Raises The Bar On Extreme Weight Loss Science - Do you struggle with your weight? - Are you looking for a quick, easy AND proven way to naturally help you melt away the pounds & inches? - Are you fed up with diets that "reward" you with even more lbs after you're done? If you answered YES to any of these questions, it's time to discover the revolutionary metabolism-boosting power of TerraPur Green Coffee Bean Extract. 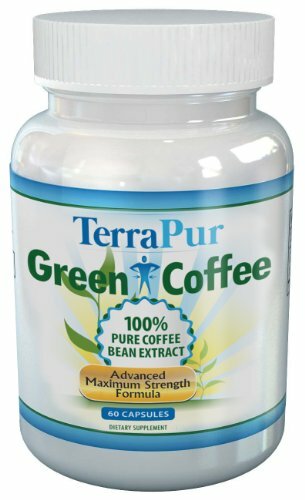 Loaded with the highest allowable concentrations of Green Coffee Extra (GCA®) and 50% Chlorogenic Acid, TerraPur is the 2013 Breakthrough Weight Loss Supplement. Real Results You Can See Now, you have exactly what you need to say "Goodbye" to those unwanted & ugly pounds and inches once and for all... - No more struggles - No more embarrassment - No more yo-yo dieting Get More For Less Buy One Bottle, Get One FREE For a limited time, get one bottle at the regular price and receive another FREE ($39.99 saving). You get TWO FULL MONTHS of fat-blasting power for pennies a day. Plus, Enjoy Our 365-Day No Questions Asked Guarantee Take a full 365 days - ONE YEAR - to experience the benefits of TerraPur. Then, if you are not 100% satisfied with your results, send back the bottle and we'll refund you 100% of your purchase price. Hurry Up! Our Limited Supply Is Going FAST... We can only offer our two-for-one offer while our current inventory lasts. Take advantage of this exceptional opportunity to GET TWO FOR ONE.